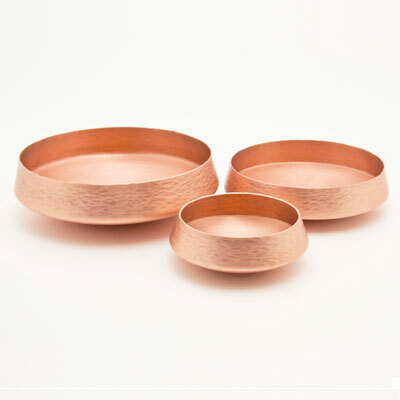 Copper Vessels [AJ_Copper_Vessel] - AUD $120.00 : Kif and Katast, a new contemporary design space featuring our in-house range alongside the works of local & international, established and emerging artists. Available in several sizes, these unique, beautiful copper vessels have been formed using a combination of industrial and traditional hand hammered silversmithing techniques. Designed by Australian jeweller Alison Jackson, the vessels have been sealed, allowing them to be used as functional vessels for dry food, or displayed around the home as beautiful objects. Please note, due to the handmade nature of these pieces, slight variations to the vessel dimensions may occur.